and even he couldn’t manage it. Yakhnich Yamaha’s Sam Lowes has claimed the first Supersport pole position of the year with a spectacular time of 1’32.545 set in yesterdays Q1 session that despite coming close, even the Lincolnshireman could not beat himself in todays final qualification. Until a few minutes to go, it looked at is Lowes could be over a second faster than second place man Kenan Sofuoglu, however the 3 time champion managed to reduce the gap to around 0.6 of a second with a 1’33.157. It could very well be a two-horse race tomorrow, as third placed Fabien Foret was over half a second behind Mahi Kawasaki team mate Sofugolu. A stunning debut qualifying performance from PATA Honda rookie Michael van der Mark put him in fourth, ahead of an equally stunning debut from Irishman Jack Kennedy who put his Rivamoto Honda into 5th. Davide Salom put in the 6th fastest time on his Intermoto Kawasaki, the 2011 runner up returning to WSS after a year in WSB with Pedercini. The MV Augusta F3 of Rolfo was 7th in an impressive first time out for the Italian machine. 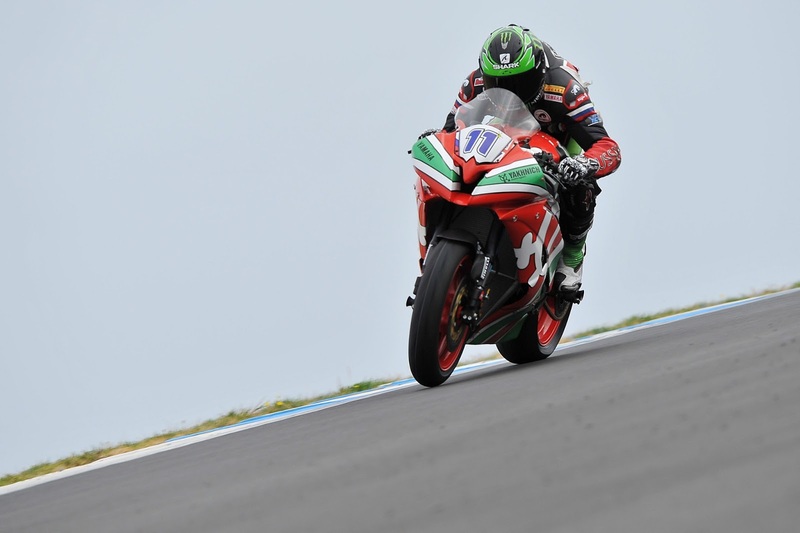 Antontelli was 8th with Kev Coghlan putting his ZX6R Kawasaki into 9th in yet another superb WSS debut. Lorenzo Zanetti rounded out the top 10.